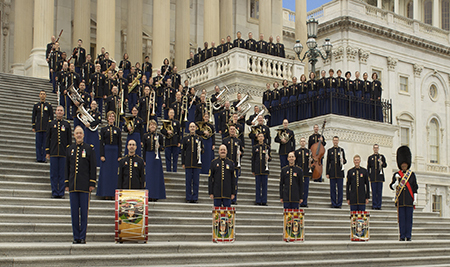 As the premier touring musical representative for the United States Army, the Field Band travels thousands of miles each year throughout the nation and abroad, keeping the will of the American people behind the members of the armed forces and supporting diplomatic efforts around the world. Since its formation in 1946, the Field Band has appeared in all 50 states and in more than 30 countries on four continents. Past performance highlights include World War II 50th anniversary commemorations in the United States and Europe, Presidential Inaugural Parades, the rededication of the Statue of Liberty, nationally televised broadcasts on Memorial Day and the Fourth of July, and the 2002 Winter Olympics in Salt Lake City. Joint concerts with many of the nation’s leading orchestras, including the Boston Pops, Detroit Symphony Orchestra, and Cincinnati Pops, have received rave reviews. The Soldiers’ Chorus is the vocal complement of The United States Army Field Band of Washington, DC. The 29-member mixed choral ensemble travels throughout the nation and abroad, performing as a separate component and in joint concerts with the Concert Band. The musical backgrounds of Soldiers’ Chorus personnel range from opera and musical theatre to music education and vocal coaching; this diversity provides unique programming flexibility. To learn more about the U.S. Army Field Band & Soldiers’ Chorus, visit www.armyfieldband.com. FREE tickets are available beginning Monday, March 4, and must be reserved in advance by visiting or calling the Luhrs Center box office at 717.477.SHOW (7469). There is a limit of 4 tickets per order and online orders are not available. Organized groups of 20+ should ask for a group sales representative when calling the box office. Ticket holders should be seated for the program by 7:15 PM. Unclaimed seats will be released to non-ticketholders at 7:20 PM.